Paul di Resta will line up against Lewis Hamilton and Jenson Button as Britain's third driver on the Formula One starting grid this season after being named as Adrian Sutil's Force India team-mate. Sutil, the 28-year-old German who made his debut with the team in 2007 when they were named Spyker, has been retained for a fifth successive year. Germany's Nico Hulkenberg, discarded by Williams at the end of last season to make way for Venezuelan rookie Pastor Maldonado, was appointed test and reserve on a long-term contract. The line-up, announced at a news conference in Di Resta's home city Glasgow, was a major career setback for Italian Vitantonio Liuzzi who partnered Sutil last year and had hoped his contract would keep him in the race seat. Liuzzi's only hope of a seat now is with struggling Hispania alongside Indian Narain Karthikeyan. 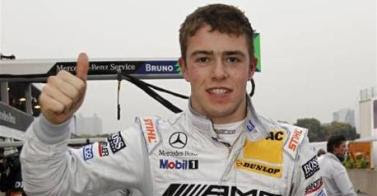 "I am thrilled to be making my race debut this season," said Di Resta, 24 and last year's champion with Mercedes in the German Touring Car series. "Becoming an F1 driver has been a long-held ambition of mine, something I've wanted to do since I first stepped into a kart, and to finally realise it feels amazing," added the cousin of double Indy 500 winner Dario Franchitti. The season, an unprecedented 20 races including a new Indian Grand Prix, starts at the Sakhir circuit on March 13. Di Resta has experience already of many of the circuits through his role as team reserve last season and from taking part in Friday practice. Sutil had been linked with several other teams last season but ultimately it became clear that Mercedes-powered Force India remained his best bet. "I've always said that I feel good in this team, it feels like family and when you feel good you are confident and can push to your maximum," he said. "We've made some good progress together over the past four years and I'm excited to be part of the the team when it takes the next step, which is hopefully to become a front running team." Force India have yet to win a grand prix, although they did take pole position in Belgium in 2009 with Italian Giancarlo Fisichella and finished second in that race. The team were seventh overall last year, a point behind Williams who enjoyed their first pole position since 2005 thanks to Hulkenberg in Brazil. "I am genuinely excited by the drivers we will be fielding in 2011," said owner and team principal Vijay Mallya. "I believe that the combination of talent we've assembled gives us one of the strongest lineups on the grid. Adrian has matured into one of F1's most consistent and highly-rated young drivers, while Paul is, I believe, a real star of the future. "He has won in every category in his career and this base speed was in evidence when he got in the car on Fridays last year. "With Nico, signing him was too good an opportunity to let by. He showed a good racing head and talent and I was amazed by his control in Brazil last year. "Together I think they are a formidable partnership and will help take us to the next level of performance."